When I was a kid all diners were run by Greeks. They always had the typical 300 or so expected diner items on the menu, but they also included some Greek specialities. I found ordering gyros, souvlaki, and moussaka to be down right exotic. 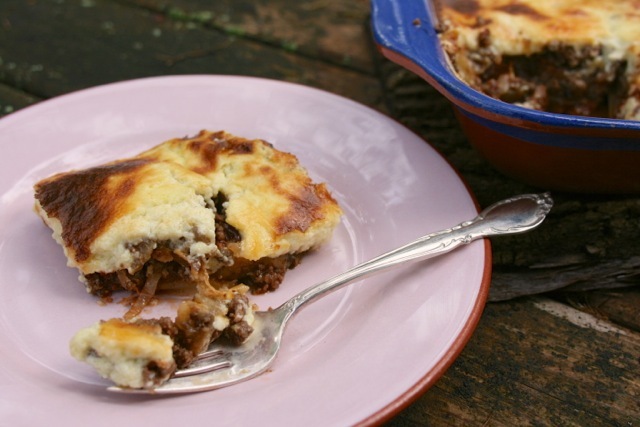 Moussaka was always one of my favorites... Most diners seemed to make their topping from leftover mashed potatoes, which was delicious but a little heavy. In my version I make more of a traditional light béchamel topping and to save time I sauté the eggplant and mix it with the meat instead of layering it. The result is all of the classic moussaka flavor with a lot less work. 1) Preheat the oven to 450 degrees. Spray the bottom of a 9x9 inch baking dish with olive oil. Place slices of potato close together in the pan. 2) In a large skillet heat 3 tablespoons of oil on medium high heat. Saute onions, garlic, and eggplant. Do not brown the garlic. Add clove to oil to help it bloom. 3) When vegetables are soft remove them from the skillet. Add 1 tablespoon of oil heat. Add the beef and cover it with worcestershire sauce. Saute until it is no longer pink, but do not brown the meat. 4) Add the vegetables back into the skillet and mix them with the meat. Add the tomato paste, salt and pepper. 5) Layer the meat vegetable mixture over the potatoes in the baking dish. 6) In a sauce pan melt butter on medium heat to make bechamel sauce. 7) When the butter is melted whisk in the flour. Whisk until the flour is smooth about 1 minute. 8) Add milk slowly and continue to whisk. Keep whisking until the mixture begins to thicken not boil. 9) Remove pan from heat and slowly whisk in the egg yolks, parmesan, nutmeg, and salt. When the sauce is mixed well pour it over the meat vegetable mixture. 10) Bake for about 20 minutes or until the top becomes a golden brown and the sides are bubbling. 11) Remove from oven and let cool for about 15 minutes. Great served with a greek side salad. The Mexican seasoning on these meatballs makes the taste of these really unusual. 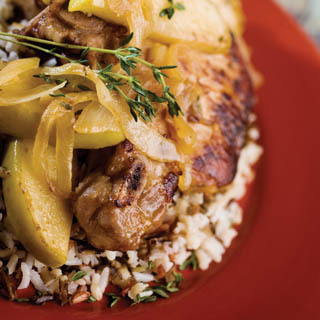 Apples, beer, cinnamon... these chops are smothered in all the great flavors of Autumn. I can just smell these apple treats baking and then breaking them apart. Light, airy and steaming good flavor. Thanks for hosting the party. Your Moussaka looks delicious. Good to see you Annamaria. I always look forward to your recipes. We are thankfully getting some rain tonight and it feels all cozy like fall is coming soon. Your Moussaka would be perfect for a cozy night. Have a great weekend and thanks for the party. Glad to hear it cooled down for you too. It has been lovely in NY. Have a great weekend too. Mm, Diane, I think I need to give eggplant another chance. 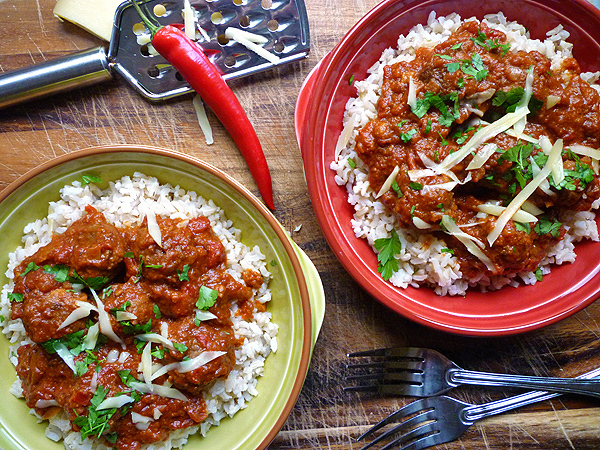 Mixed with beef and topped with cream... how can you go wrong? Thanks for the party, Diane! You are welcome Jamie. good to see you. Thanks Lisa... nothing like a classic diner meal. Thanks for hosting the party! your Moussaka looks yummy. Have a great weekend! Thanks Shamene, good to see you here again. Thanks so much Diane for another party!! You are welcome Winnie... a little rest for you between holidays. Diane, your moussaka looks so warm and comforting on this cool and dreary day we are having. Thanks so much for hosting each week and I hope you have a lovely weekend. Cold and dreary... that's not good. The Fall should be crisp and bright. Hope you end up with a nice weekend. Sounds great... I never poach chicken so I look forward to checking out your post. I love moussaka Diane but can never get my bechamel right. It's always lacking richness. I think I might try it with the egg yolks as you have. Thanks for the party. This sauce worked really well. I used less milk then when I made it in the past and the yolk definitely helps to firm it up. 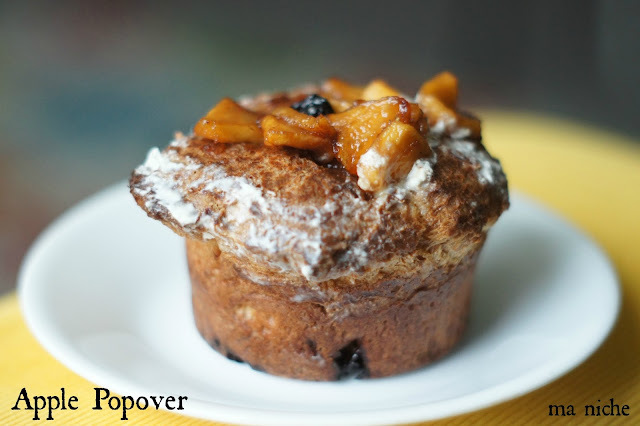 That Apple Popover looks AMAZING! I'm slobbering. Isn't it gorgeous.. so light. I had always wanted to make it too and this recipe is really simple. even now long time diners are still all owned and operated by the Greeks. I am lucky to have grown up near a Greek enclave in Astoria, Queens and eating lots of traditional Greek foods my whole life however moussaka is one Greek dish I don't eat because eggplant and I hate each other on site but I have made adapted versions using zucchini before. With zucchini, I would love your less work version. I never had it with zucchini... brilliant idea and you are so lucky to have real Greek diners. This is a great dish for our tour of Greece it looks delicious!